Functional but ugly. I’ve had recovering it on my to do list for quite a while. So I finally did it. It took about an hour, which made me wonder why I waited so long. First, I unscrewed the seat and the seat back. I was left with the frame, which got a tube of fabric squished on it. I know I marked this as a not sewing project, but that was all I sewed. 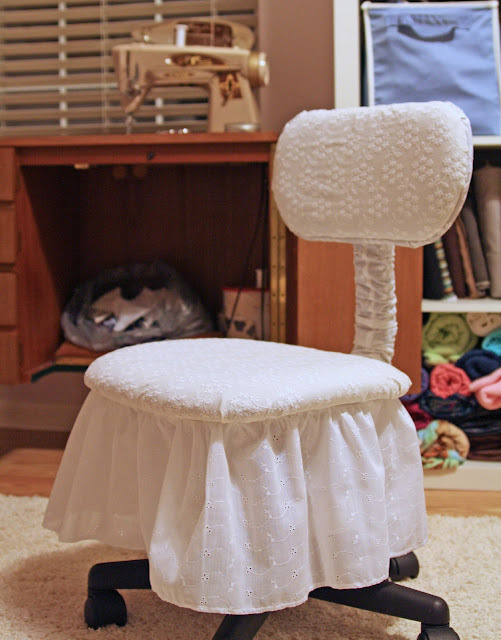 I stapled fabric and ruffle over the seat from underneath. The trick to re-upholstering chair seats like this is to staple down the center of each side first, doing all 4 sides, then working out to each edge and tucking/pleating as you go. 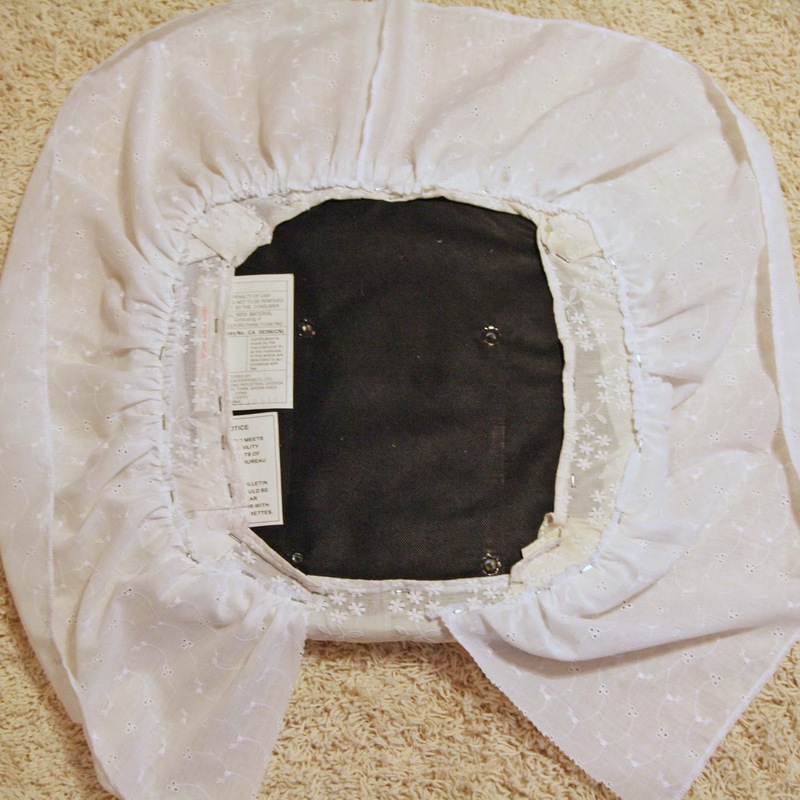 That way the fabric doesn’t get pulled wonky and you don’t end up with a ton of extra fabric around the corners. 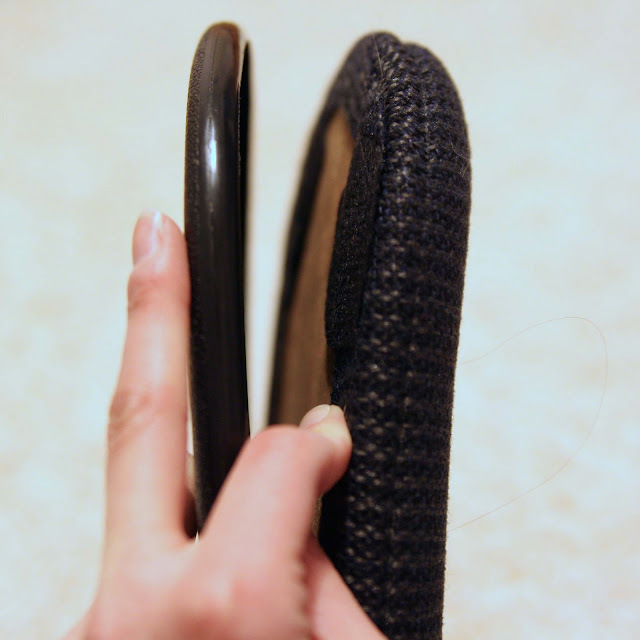 The seat back came apart by pressing and wiggling. 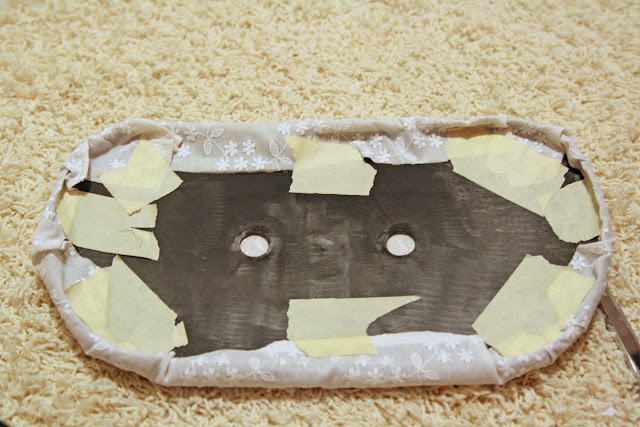 I covered the front part the same way as the seat, then covered the plastic part using a top-secret method. Masking tape. Really, the plastic lip is what holds this in place, so the masking tape was just to hold it while I put the two pieces back together, which require some flathead screwdrivers (to hold the lip out) and my knee (to press the top in). And of course as soon as I did this, I saw Sugar Bee Crafts chair redo and now I have to go get some spray paint for the black parts you can still see. What a great job–that looks fantastic! That is gorgeous!! I wonder my husband would want his office chair covered in pretty fabric? Love the chair but especially liked seeing the old Singer Bullet in the background. I’ve always used these, I have the 401 now and love it too. These are the best machines ever made! P.S. I’m with hensrule…I love that beautiful sewing machine in the background too. Wow this is great, I wonder if they’ll let me do this to all our office chairs at work! What a difference! Thanks for sharing at shine on fridays!! 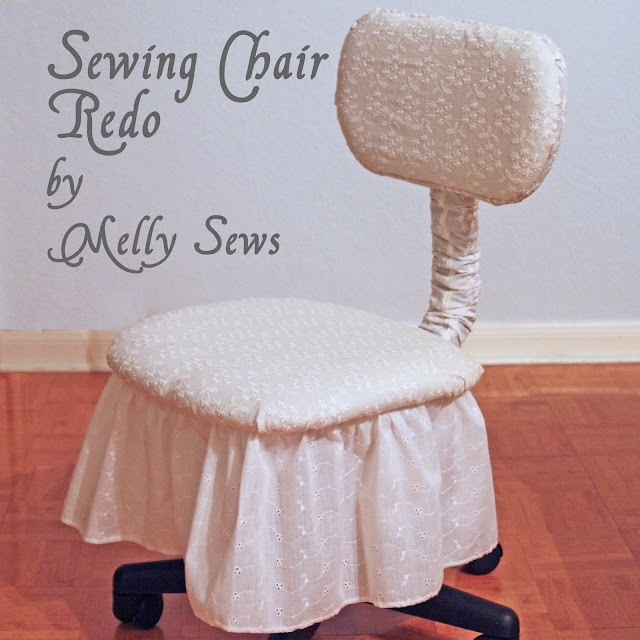 I’ve got a chair just like this one, and it is totally getting a make over! So smart! This is great! My husband has a very similar chair in our basement that I plan on recovering! This is a great make-over..I may have to do mine! Great idea, I’m going to have a look at mine too ! Love your new chair Melissa!! I saw your post this morning and decided to cover my office chair. It’s not as nice as your chair but considering my sewing machine quit working while I was making the cover for the back, it’s not that bad. LOL!! Thank you for your fabulous blog!! I love all of your wonderful projects!! 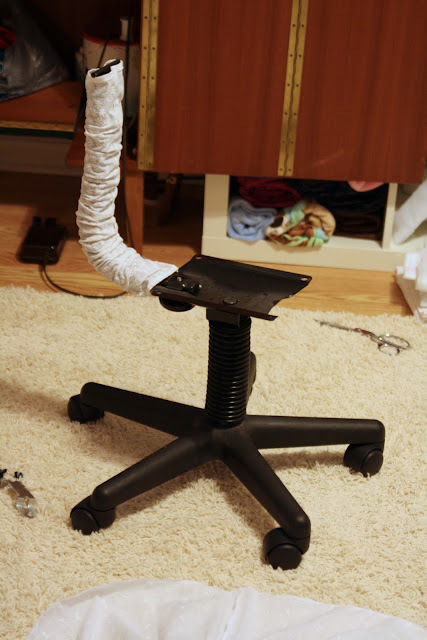 This is a clever treatment for a computer chair. I’ll try it with my computer desks as well. 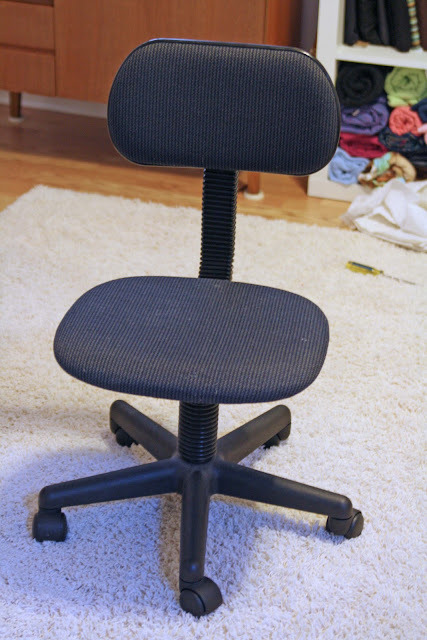 I have the same chair and wanted a change for it. Thank you for THIS idea!